MiMedx CEO Pete Petit pronounces his last name, "petite," but there is nothing small about his ability to build a successful business. 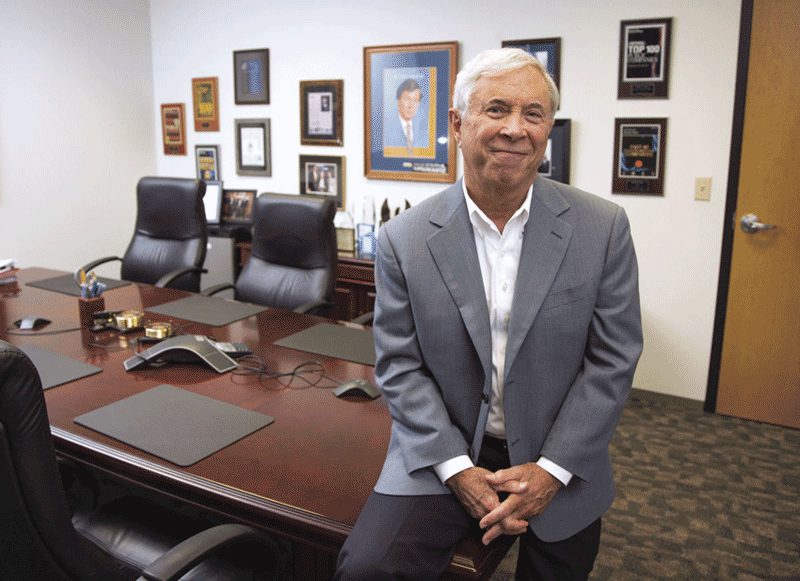 The self-proclaimed serial entrepreneur has nearly five decades of business expertise, which began in 1970 with the formation of his first company, Life Systems. "The key is to have a great product line and employees with integrity," Petit said. "I must be talented at building a business, but I enjoy it. I enjoy the interaction with people, generally mentoring people and seeing the successes of these products, which are helping thousands of patients all over the world." Life Systems, later renamed Healthdyne, was launched after the loss of Petit’s second son due to a crib death. Understanding the need for something to help prevent instances of Sudden Infant Death Syndrome, he and his company developed the first home physiological monitor for infants. The product was the "Infant Monitor," which helped to usher in the era of high technology home health care. The company went public in 1981. Over the next 25 years, Heathdyne acquired approximately 30 companies. Healthdyne also formed several new subsidiaries and companies were sold to redirect funds into other new technology assets, including information technology. In 1995, Healthdyne was split into three separate, publicly traded companies and those companies were sold, publicly traded and merged. In 1996, one of those companies, Healthdyne Maternity Management, merged with its major competitor in the management of high-risk pregnancies, Tokos Medical, to become Matria Healthcare. That company created and purchased businesses, which also went through a series of sales and mergers, resulting in hundreds of millions of dollars in profit. Matria Healthcare was acquired in May 2008 by Inverness Medical Innovations for $1.2 billion. At that point, Petit decided to take a much-deserved break and retire, setting up a family office and managing his family’s assets. "But that only lasted about eight months," Petit said, with a laugh. "I was getting the itch to have something real to do everyday." So when a friend of 40 years came to Petit with a company that was almost bankrupt but had a great deal of potential, Petit dusted off his C-suite suits and stepped in as Chairman and CEO of Marietta-based MiMedx in February of 2009. He brought many of his former executives back onto his team and the company made its first acquisition under Petit in January of 2011. MiMedx is a biopharmaceutical company that develops and markets tissue grafts from recovered placentas, which are used to treat soft-tissue wounds. This year, MiMedx was named the No. 5 on Fortune’s list of 100 fastest-growing companies, beating out several major, well-known companies such as Facebook (No. 6) and Amazon (No. 9). Petit said the company was made up of 23 employees when he came on board and it now has 840 people on the payroll. Today, philanthropy has become a staple in Petit’s life, as he has given millions of dollars in charitable contributions to various organizations, especially for scholarships at his two alma maters, Georgia Institute of Technology and Georgia State University. Growing up in a poor family, Petit had to work hard to put himself through college and he understands that many students face those same financial struggles today. Cobb County has been his home for several decades, with all three of his children graduating from Cobb County School System high schools. "Cobb is a little quieter than the Atlanta environment. I personally enjoy that. It’s a little more comforting and not as hectic of an environment as Atlanta. We have people come to work for us from all over the country and most, when they move here, end up settling in Cobb. It’s just a good place to be with good schools and not as many of the traffic issues as Atlanta," Petit said. As for the future of his company, Petit said MiMedx is continuing to grow at a fast pace as it has three FDA studies currently ongoing. All will have milestones and successful clinical studies published soon, he said. "People ask me about retirement and I still put in 60 to 70 hours a week," Petit said. "That’s probably more than I’d like to, but that’s what I have to do right now. If this company gets sold, I’m not sure I’ll step back into the reins of a publicly-traded health care company again, but who knows. I tried to retire for the first time in the mid-90s, and that didn’t last either. I’ve flunked retirement twice." He may have "flunked" retirement twice, but he is far from flunking entrepreneurship.